Shi Yan’s (石岩) father, Shi Feng (石峰), was an art consultant and composer for the Dalian Department of Cultural Affairs, Liaoning Province, and is now retired. His mother, Han Shuxiang (韩淑香), was a surgeon in the Dalian Municipal Central Hospital, and is now retired. 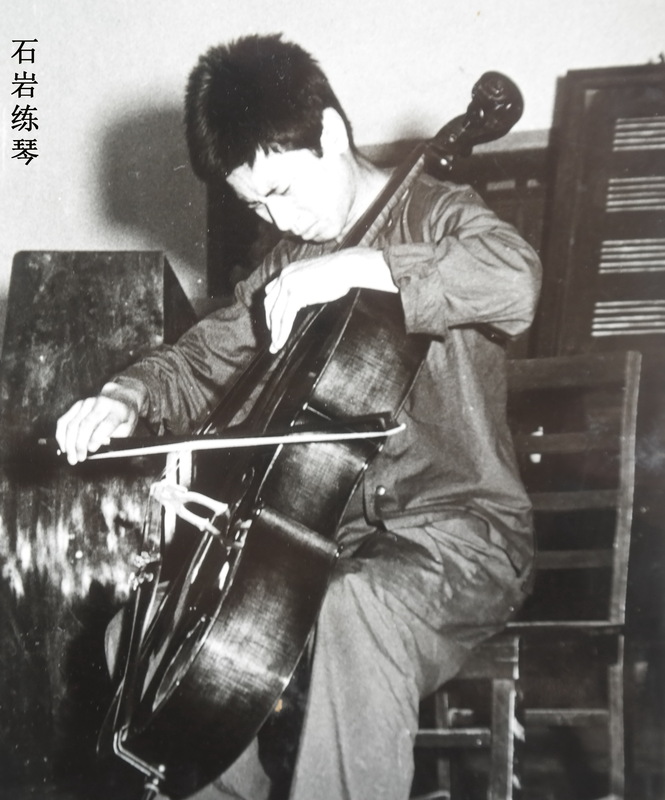 His eldest sister was a cellist at the Liaoning Opera. She divorced her husband after June Fourth to protect him, and is now retired due to illness. Shi Yan’s brother-in-law worked in the Liaoning Province State Security Bureau. His second eldest sister was a student at the Dalian University of Foreign Languages, and is now deceased. Shi Yan was married on May 1, 1989. His wife works at CCTV. This had been a family of artists, blessed and admired. The crack of a gunshot on June Fourth changed everything. Right after arriving in Dalian and settling in our hotel, we contacted Shi Yan’s mother, Han Shuxiang. 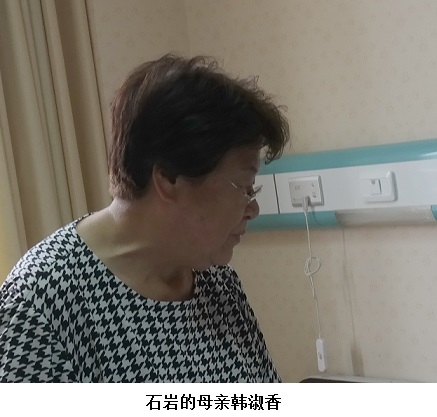 We found out that she was staying in the Dalian Municipal Central Hospital taking care of her husband so we went straight to the hospital to visit them. As we entered the hospital room, we saw Shi Feng sleeping, with tubes attached to different parts of his body. In order to prevent the tubes from coming loose, his arms and legs had been secured to the bed. We couldn’t control our tears when we saw this. Shi Yan’s mother, Han Shuxiang. 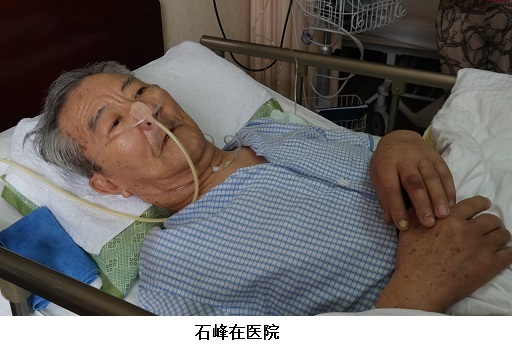 Shi Yan’s father, Shi Feng, in the hospital. Han Shuxiang patted her husband and said, “Old Shi! Open your eyes and see who has come to see you—representatives from the Tiananmen Mothers have come from Beijing to see you.” At this, the old man’s eyes moved slightly; he seemed to have heard his wife. Han repeated her words two more times, and it was clear her husband understood—his body moved a bit, and his eyes slowly opened. When he saw us, he tried hard to say something but although his lips moved, no words came out. Tormented by illness, he could no longer use language to express himself. We saw only tears flowing from the corners of his eyes. 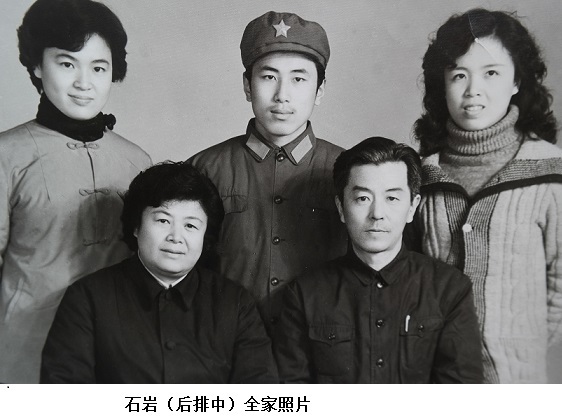 With the crack of a gunshot on June 4, 1989, the Communist Party shattered the hopes and dreams of this family, snatching away the precious lives of two of the couple’s children. When he was killed, Shi Yan left behind his newlywed wife. Their happy life that had only just begun was brought to a screeching halt. After Shi Yan was killed, the family was changed irrevocably, and was racked by adversities one after another. His second eldest sister was then studying at the Beijing Foreign Studies University. She handled Shi Yan’s funeral arrangements, along with the eldest sister and the eldest sister’s husband. The grief dealt his second eldest sister a serious psychological blow. Later, unable to bear the pressure and discrimination from society and with no way to escape her cruel reality, she ended her young life in despair, leaving the sorrows and worries of this world. After handling Shi Yan’s funeral, the eldest sister’s husband was fired by his work unit. Upon realizing the great impact of her brother’s death on her husband’s future, the eldest sister made the ultimate sacrifice: divorce. Several years later, she was diagnosed with a brain tumor and was forced to leave her position at the opera. The family was thus shattered. In torment and extreme suffering, the father fell ill and became bedridden. When a father is old and sick, it ought to be the children who care from him. But two of his children departed the world early, and the only remaining daughter is also ill. So the burden falls on the 76-year-old mother. These two elderly people are long-term hospital residents, unable to return home. You can imagine how difficult this kind of life is, and how much they suffer inside. No person with a conscience can remain unmoved by their situation. Shi Yan practicing the cello. The elderly father is in a chronic semi-comatose state. When his wife asked him if he missed his son, although he shook his head slightly, tears ran down his face. When Shi Yan died, the children did not tell their parents. They hid this information for five years, afraid that their parents would not be able to withstand the blow. The children lied, saying that his work unit had sent him on a classified military assignment. After five years without a word from their son, the parents began to grow suspicious, so they called their daughter-in-law in Beijing. Unable to restrain herself, she told her mother-in-law the truth and about the misery she had kept buried in her heart all those years. After his father found out, this already introverted man could not deal with the suffering. To let out his grief, he frequently traveled to the ocean’s edge to cry. He fell ill under enormous psychological stress. His illness took over his body, and he has been bedridden ever since. Later, his parents requested that their daughter-in-law send Shi Yan’s ashes back to Dalian. After five long years of separation, Shi Yan finally returned to his parents’ side and his home. After returning to Beijing, we continued to worry about the state of Shi Feng’s health. We found out that he was still in the hospital; the good news is that his mind is somewhat clearer than in the past. We pray that the old man has a speedy recovery, and that he is blessed and protected, so he can hold on until the day of justice for his son. In the almost 25 years since June Fourth, his parents’ work units never knew of Shi Yan’s situation—they only knew that Shi Yan was abroad. It was not that his parents didn’t want to speak of it, but that the two are unable to bear the pressure and discrimination of society. They have only longing, pain, pressure, and a glimmer of hope deep in their heart. This is the state of this June Fourth victim’s family. Through this visit, we vividly understood the vast difference between this family’s situation before and after June Fourth. Every time we think of it we feel suffocated up, and it is difficult for us to calm down. Two elderly people depend on one another and share in each other’s suffering, waiting out their final days with a glimmer of hope for the arrival of justice. Shi Yan (石岩), 27, served as a cellist in the Air Force Political Bureau Cultural Work Group after graduating from the PLA Academy of the Arts. 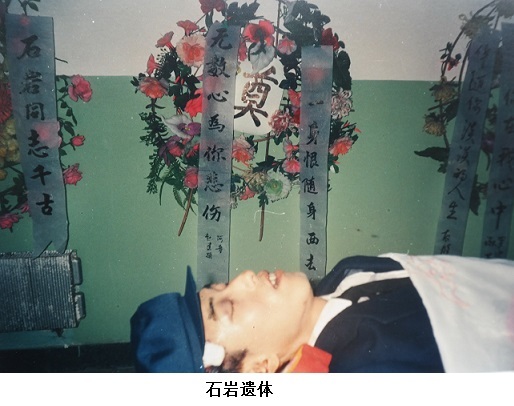 He was shot in the head in the early morning of June 4, 1989, and died in the Beijing People’s Hospital.